First Impression: My first impression of Coyote is a familiar one. I immediately went "Aww". I have a great affinity for furry four legged creatures. I liked this card a lot, because I love furries, and he closely resembles a wolf. He is beginning an adventure and I love adventures! Description: Here we see a coyote at the opening of a wood he is about to explore. There is a necklace of beads and feathers around his neck swooshing with his quick head movements. He is alert. 6 ravens fly overhead in the dawn lit morning. Roots are thick and out of the ground a tangle of small obstacles. Colors: Pale Yellow, Peach, Pink, Lavendar, Cocoa browns, Grey, White, & Black. Senses: I can feel a chill in the air and smell the earth. The barren branches remind me of fall and the sky looks like dawn is coming. I can hear the cawing of the ravens and the wind blowing through the naked trees. Symbols: The Raven, The Coyote, the barren trees, roots upraised, dawn, necklace. Story [Intuitive]: Coyote stands before the opening to the forest. He rests his paws, although he is anxious to keep moving. In the middle of the night he birthed a great idea, and he followed it like a dreamer in the world of dreams. It was a great adventure to be explored! Oh how Coyote loved a good story! Silently he thought, They will tell of my grand travels many years! This will be the story the children will beg the elders to tell at night! The ravens awakening in the morning take to the sky and Coyote jerks his head from his thoughts up at the sky. "Beware! Beware!" The ravens cry out, warning the Coyote of danger. "Bah! I am the great and powerful Coyote, I fear no danger!" And without heading the warning of the silly birds he trotted off into the forest, his head filled with grandeur. My Experience as the Fool: Although no one experience stands out in my mind I have often rushed into things without heed of warning or thought. I am a very impatient person sometimes when I am excited or want something. Astrological Reference: Couldn't find an astrological reference at first. Later thought of the "Dog Star" Sirius. Cultural Reference: Native American traditions describe the Coyote as a Trickster, who had stole fire from the gods as a gift for mankind. Many tribes have different stories for coyote ranging from a fool to a wise being. There is also a story of Coyote bringing death to the world, after discussing with Wolf that it would help from overpopulation. As a result his son was the first to die, and in his grieving he knew he had been wrong. Elemental Reference: Earth is very present in this card, with the trees and roots. We have the dawn sky and the ravens overhead too we have the presence of Air. Numerology Reference: 0 - Limitless, Unknowable, No-thing, Boundless, Purity, Possibility, Source, Cosmic Egg. Possible Meanings: The start of a new adventure, Following a dream, The dawn of a new day. Reversed: Not heading warnings, Rushing in, Being naive or inexperienced. First impression: Oh wow, what a gorgeous card – I LOVE the colors of it! Can’t wait to see what it has to tell.. I actually love the fact that this card represents Native American nations, since I did my previous (and first!) study of Vision Quest, a wonderful Native American deck! It’s a nice continuum to this deck.. Symbols*: The coyote’s journey takes him on a rocky path covered with entwined roots. The roots represent the obstacles that the unwary traveler will most likely encounter- The rocks contrast the roots with their stabilizing properties – but one must be careful not to trip on these earthly protrusions. The six birds flying overhead represent changes and impermanence. The raven in the forground is beckoning the coyote to continue. The coyote must pass by the bones, symbolic of stagnation, in order to explore new opportunities of self-awareness. The dead trees are reminders that all things must pass and new paths should be made in order to promote new growth. The spirals on the rocks are reminders that life is a continual journey to be explored. The dragonfly represents our goals and dreams and the penetration of veils of deception. The necklace of feathers and beads represents flight and the continuous pursuit of truth. The subtle winding snake is ever changing and merging with the tree roots, a reminder that we have to activate all of our senses while traveling on the path. Description*: In Native American traditions Coyote is the fool, the teacher, the trveler, the transformer, and the trickster. Stories about Coyote are varied and sometimes complex. But the essence of his character as culture hero can be found throughout the Native American cultures. He often travels with other animal companions and engages in all manner of wiliy behavior. His curious nature exemplifies his tendency to be adventurous and even child-eating monster. In this story his brazen self-confidence has a positive outcome. But in another story his impetuous behavior causes death to come to the world. Coyote argued over Wolf’s decision to allow people to be rejuvenated after they died. Coyote convinced Wolf that this would lead to overpopulation. Wolf agreed but caused Coyote’s son to be the first to die. The grieving Coyote realized his foolishness and learned to accept the consequences of his actions. Possible Meanings*: Coyote represents a zest for life. He is both the lighthearted traveler imbued with optimism and the dark shadow of the psyche that may pose conflict as we proceed down the path. Before we embark on our journeys, it is important to remain optimistic and adventurous, but it is equally important to be aware of the possible dark forces that may arise along the way. These shadows of the psyche will provide important ingredients toward the attainment of wholeness. The coyote as a fool is also a teacher. With his guidance we can learn to adapt, change, and grow as new situations present themselves to us. Senses: I can feel the freshness of a new morning, a chance for a new beginning. The Coyote is looking at me as if to say "follow me, follow my path and you will get far". He seems so curious yet very loving. I can almost smell the air. Thougths/Points to Ponder: Another start, another beginning. Let’s see where he will lead me.. When I ordered the deck, and after reading some of the reviews over here, I was a bit worried that it might be "confusing" because of too many details and too many stories/animals. I find this deck gorgeous, and it is beyond what I expected. I worried about nothing! I love this deck ! The first thing that I notice about this card is that Coyote seems to be looking at me. I see that it is either sunrise or sunset. Next, I see that there are birds above him, along with some gnarled tree branches with leaves scattering off of them. After that, I see Coyote's necklace. It has feathers and beads on it. After looking at the main parts of the picture, I look at the ground. At first I only see rocks and roots, but then I notice two things that catch me off guard. The first thing is a bone, probably from another animal that had tried to pass through where Coyote is going now. The next thing I see is what appears to be a snake. You have to look quite closely to see it, as it appears to be part of the tree roots. I look at the picture again, and notice that there are designs on some of the rocks near the edge of the picture. The last things that I notice are a dragonfly, near the bottom right-hand corner of the picture, and a small bird in the left-hand corner of the picture. This is a beautiful card, if somewhat menacing to me. I think that Coyote is looking at me, telling me that I need to trust him. I believe that the birds above Coyote (which look like vultures to me) may possibly be waiting to see if he dies while traveling along this dangerous path. To me, the bones show that something has already died along this path. The snake also makes this card somewhat menacing in my eyes, not because I'm afraid of snakes in general, but because I have a feeling that this one may be venomous. However, the dragonfly is comforting to me, because dragonflies generally live around water, and water helps maintain life. The bare tree branches lead me to believe that the trees are dead. I think that maybe the smaller bird in the corner is Coyote's guide. If Coyote makes it past the rough patch along the path, and trusts the little bird, I think that he will go far. However, if he goes down the path and doesn't pay attention to his surroundings (the rocks and roots) or his guide, he may die. Sometimes I get scared to go down a new path or start something new. Often I feel like people are just waiting for me to fail (the birds above), so that they can tear me apart for it. Or possibly people even set me up for failure (the snake). What I need to do is find comfort in the fact that everyone fails sometimes. Failure is not the act of falling down, but the act of staying down. I also need to look for the good parts of what may seem scary (the dragonfly). I feel like I need to trust what Coyote and his little bird guide are telling me, and go down that new path, no matter how scary it seems. However, I must be aware of my surroundings. 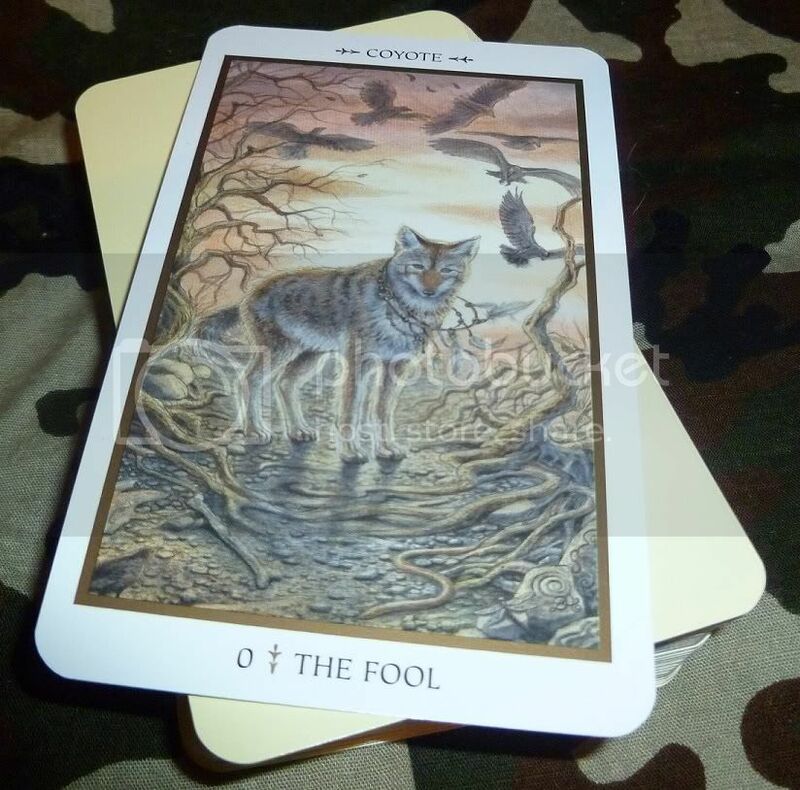 In Native American traditions, Coyote is the fool and the trickster, along with other things. Coyote tends to be adventurous, and even careless at times. He generally travels with other animal companions, and gets into all sorts of mischief. Setting upon a journey, adventurer, inexperience. UPRIGHT- In the upright position, I believe that this card stands for new beginnings and/or facing your fears of those new beginnings. It can also mean looking for the good in a bad situation. I think that this card can also represent inexperience, as the book says, and listening to guidance. REVERSED- In the reversed position, I think this card means stagnation, represented by the bones. It can also mean only seeing the bad, or seeing mostly bad in a situation. In this position the card can also mean things such as not facing fears, and not listening to guidance when it is needed. I know I said that the birds flying above Coyote look like vultures to me, but ARE they vultures?